Shakey Graves is quickly becoming an inspiring independent roots music success story and in a big way, despite what seem to be his best efforts to remain as unassuming, humble, and non-commercial as possible, while people gladly shove dollar bills at him left and right for his music that speaks to them in such a crafty and sincere manner. He’s becoming sort of a unknown superstar, a cult enigma, not from sly marketing, but because he’s really as socially awkward and troubled, yet full of light and brilliance as he seems, all while still coming across as unusually grounded and affable for someone with such a robust creative spark. He’s simply a dude who wants to share his songs with you, and remains as surprised as anyone how much his simple, one man presentation has been embraced warmly by appreciative, attentive, and distinguishing fans of roots music and songwriting. 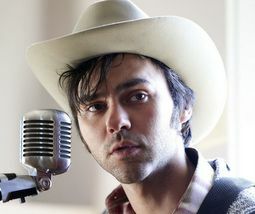 Over the last few years, Shakey Graves has become a superhero of Bandcamp, with his squiggly little recordings like Roll The Bones regularly dominating the lo-fi, self-serve, user-driven format, while his name has found its way into the lineups of prestigious, world-class festivals like Pickathon, Stagecoarch, and Newport Folk. Shakey’s success almost seems part mistake, part inevitable, but overall it’s an excellent story to renew one’s faith in the power of music, and the world’s ability to still pay attention to a worthy voice. From playing residencies at Austin bars like The White Horse and Hole in the Wall, to touring the world to critical acclaim, playing his guitar and banjo while beating on a suitcase bass drum, Alejandro has risen like a chute out of the ashes of cultural decay as a one man show, and a one man show only. But 2014 promises to see a sea change from this rising roots artist. He’s assembled a band to take his song craft to the next level. At South by Southwest in mid March, Shakey, who was on many big music outlet’s short list of up-and-coming SXSW artists to see, was showcasing his new band approach to his sound and style. Despite his own open apprehension about the new approach—“I’m also terrified of alienating people who enjoy what I do right now,” Shakey says—it fits intuitively into what you might expect from Shakey with a band, while still being offbeat enough and unexpected to accomplish the fresh approach Shakey is looking for, if only for his own personal artistic fulfillment. Whether the band thing sticks for Shakey, or he slides back into the solo show, it’s the sincerity and sheer appeal for Shakey Graves the musician; the natural, almost accidental charisma, and underdog charm, that makes him one of the best artists in 2014 to put stock into and sit back and watch it rise. This is good to hear! I’m excited for his new stuff. I watched the whole video and it was great.